An online bachelor’s in history lets students examine the past in order to better understand the present. Distance learners enrolled in an online bachelor's in history program will develop valuable analytical, writing, and research skills. Historian positions are projected to grow as fast as other occupations, rising 6% from 2016 to 2026, according to the Bureau of Labor Statistics. While job candidates with only a bachelor's degree may qualify for entry-level positions at small museums or organizations, the BLS states that most graduates work outside the field of history in education, law, publishing, journalism. What Will I Learn in an Online Bachelor's in History Program? 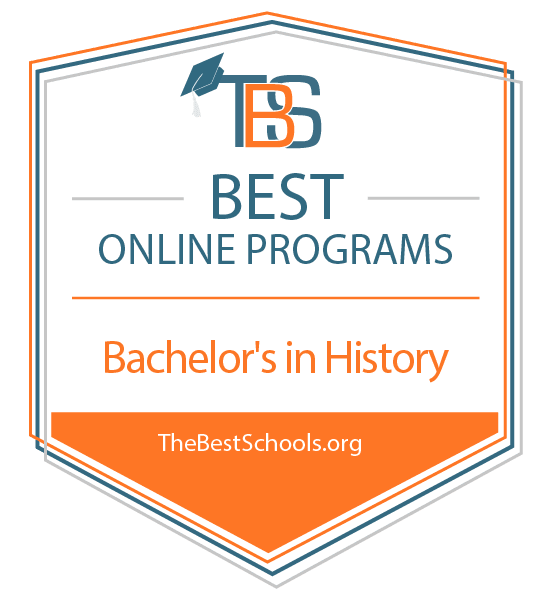 What Are the Best Online Bachelor’s in History Programs? Harvard University ranks #1 on The 25 Best Online Bachelor's in History Degree Programs! The nation's oldest institution of higher learning, Harvard University was established in 1636 by the Massachusetts Bay Colony. Harvard boasts an international reputation for academic excellence. The Harvard Extension School offers a number of distance learning programs, including a bachelor of liberal arts degree with a focus in history. Harvard's online history degree appeals to learners who want the flexibility and broad education of a liberal arts program. Students take 32 credits of history courses, with topics such as world history, Christianity, Chinese history, and the history of science fiction. The 128-credit bachelor's degree also includes coursework in the humanities, sciences, social sciences, expository writing, and foreign languages. Students must complete math, ethics, and writing-intensive credits at Harvard in order to graduate. The hybrid degree requires students to complete at least 16 credits on Harvard's Cambridge campus. Students can earn these credits in just four weekends on campus. Students can also take three-week January courses or summer school courses. The Harvard Extension School admits adult students age 21 or older who do not already have an undergraduate degree. Applicants must have a high school diploma. Students can apply by enrolling for three expository writing and math courses through the extension school. Potential students must earn a cumulative 3.0 GPA in these three classes in order to fully enroll in the history program. Incoming students can apply up to 64 transfer credits toward the degree. Harvard University is regionally accredited by the New England Association of Schools and Colleges (NEASC). University of Central Florida ranks #2 on The 25 Best Online Bachelor's in History Degree Programs! Established in 1963 as a technological institution, the University of Central Florida now hosts the largest enrollment of any American college or university. UCF offers over 200 degree options, including online degrees through UCF Online. Students interested in a liberal arts degree with a historical focus may enroll in the fully online bachelor of arts in history. Students pursuing the history degree online develop strong skills in analytical thinking, reading, and writing. Graduates work in law, education, library sciences, public history, and other careers that prioritize strong critical thinking skills. History majors complete surveys in Western civilization or world history. Students also choose electives from three of the department's four geographic regions: Asia, Africa, and the Middle East; Britain and Europe; Latin America; or the U.S. and Canada. Candidates also complete UCF's general education requirements and submit a portfolio. Prospective students must submit an online application with official transcripts from all previously attended institutions. Applicants should have competency in a foreign language and a minimum 2.0 GPA for all college work. Candidates with fewer than 60 transferable credits must also provide high school transcripts and SAT or ACT scores. UCF provides a tuition discount for Florida residents. The University of Central Florida is regionally accredited by the Southern Association of Colleges and Schools Commission on Colleges (SACS). University of Memphis - UM Online ranks #3 on The 25 Best Online Bachelor's in History Degree Programs! Established in 1912, the University of Memphis maintains six research centers, including the Center for Earthquake Research and Information, the Sparks Bureau of Business and Economic Research, and the Advanced Distributed Learning Workforce Co-Lab. UofM offers a range of undergraduate degrees, including a number of online options. UofM's online bachelor of arts in history is particularly strong in the areas of U.S. history; women, gender, and family; Asia; and Medieval Europe. The history degree online includes 33 credits in history courses, including surveys in world civilization and U.S. history. Students also complete 21 upper-division credits, with at least six outside of European or U.S. history. The university's general education requirements include classes in communications, mathematics, the humanities, social sciences, and natural sciences. UofM also offers an online master's in history for students interested in graduate-level coursework. Students enrolled in UofM's history program benefit from comprehensive advising, career counseling, and professional development opportunities. Prospective students must provide official transcripts from high school and any prior college. The school may also require SAT or ACT scores. UofM lowered its online tuition rates as of fall 2018. Tennessee residents and non-residents pay the same online tuition rate. The University of Memphis is regionally accredited by the Southern Association of Colleges and Schools Commission on Colleges (SACS). Oregon State University ranks #4 on The 25 Best Online Bachelor's in History Degree Programs! Established in 1856, Oregon State University is a land-grant institution located in Corvallis. The largest public university in the state, OSU offers more than 200 undergraduate programs and 50 online degrees. Students interested in history at OSU may choose from a bachelor of science or a bachelor of arts. OSU requires 180 quarter credits for a bachelor's degree. History majors complete 49 credits within the department, including 15 credits of historical surveys. Options include Western civilization, world history, and U.S. history. Students also complete 12 credits in global historical literacy. Seniors take a seminar and two capstone courses in the historian's craft. The BA requires proficiency in a foreign language, which students may prove through testing. Students gain practical experience through the public history internship program, which helps participants learn about history occupations. Students must complete at least 45 of the last 75 credits through OSU. Transfer students complete an online application, submit official college transcripts, and provide a resume. First year students must also provide ACT or SAT scores. OSU offers the same online tuition rate for residents and non-residents. University of North Dakota ranks #5 on The 25 Best Online Bachelor's in History Degree Programs! Founded in Grand Forks in 1883, the University of North Dakota is the state's oldest and largest university. Today, UND offers more than 200 programs, including options through UND Online. The bachelor of arts in social science with a history focus allows students to enroll in self-paced courses anytime, thereby speeding up progress toward the degree. Students enrolled in the online history degree at UND complete 125 credits, including general education requirements in psychology, sociology, political science, and economics. The history focus includes courses in North American, European, and world history, with multiple upper-level elective choices. The multidisciplinary degree emphasizes critical thinking and effective communication. Prospective students who are under the age of 25 or who have fewer than 24 college-level credits must submit high school transcripts and ACT or SAT scores. Transfer students and applicants over the age of 25 do not need to submit standardized test scores. UND accepts up to 90 transfer credits from regionally accredited institutions. The university admits new students in the fall, spring, and summer semesters. UND offers in-state tuition to all online students, regardless of residency status. The University of North Dakota is regionally accredited by the Higher Learning Commission (HLC). Liberty University Online ranks #6 on The 25 Best Online Bachelor's in History Degree Programs! A private Christian institution with roots in Lynchburg, Virginia, Liberty University focuses on distance learning options for students across the world. Of the school's 110,000 students, tens of thousands of learners attend courses exclusively online. Liberty offers over 550 degree options and nearly 300 online programs. Liberty's online bachelor of science in history provides students with strong analytical and research skills. History majors complete 42 credits within the major, including courses in Western civilization, historical methodology, American history, and world history. Students choose advanced courses in a focus area. In addition to the major coursework, the fully online program requires general education credits and religion courses. Seniors complete a capstone seminar which emphasizes core research skills. Students can transfer up to 90 credits toward their degree. Liberty operates on an eight-week course schedule with eight start dates each year. The program requires no set login times, providing flexibility for working students. Applicants complete an online admissions form and submit unofficial college transcripts for all institutions attended. Candidates also self-certify that they are high school graduates. Liberty provides a tuition discount for service members, veterans, military spouses, and Department of Defense employees. University of Massachusetts - Lowell ranks #7 on The 25 Best Online Bachelor's in History Degree Programs! UMass Lowell was founded in 1894 as a teaching school. Today, the public institution offers over 175 degrees in disciplines such as engineering, humanities, and business. The bachelor of liberal arts with a concentration in history at UMass Lowell allows students to fully customize their degree. History students also choose one additional concentration area with options like art history, gender studies, english, philosophy, and political science. UMass Lowell's online degree in history prioritizes flexibility and a balanced liberal arts curriculum. The program benefits transfer students and others who have earned significant college credits. The history concentration requires 36 credits in the history department, with at least half at the upper-division level. Course offerings include Western and world civilization, African-American history, the Civil War, and the Holocaust. In order to earn the bachelor's degree, candidates complete 120-122 credits, including general education classes and a foreign language. Prospective students submit an application and official transcripts showing all college credits earned. Transfer students from four-year institutions can apply up to 90 credits toward the degree, while students from two-year colleges can transfer up to 60 transfer credits. UMass Lowell charges the same online tuition rate for Massachusetts residents and non-residents. University of Illinois at Springfield ranks #8 on The 25 Best Online Bachelor's in History Degree Programs! The University of Illinois Springfield opened in 1970 as an upper-division university, offering only graduate programs and the last two years of undergraduate education. After joining the University of Illinois system in the 1990s, the school began to offer four-year bachelor's degrees. Today, the school offers more than 30 undergraduate programs, including online options such as the bachelor of arts in history. The online degree in history emphasizes a broad humanities education, research skills, analytical methods, and critical thinking. History majors complete 33 credits, including six credits in lower division courses such as European history, U.S. history, or world history. Students also complete eight credits in non-U.S. history and 19 credits in upper division history electives. Seniors take a capstone course on a current issue in the study of history. Students must earn at least 30 credits at UIS in order to graduate. Distance learners must maintain a minimum 2.0 GPA. UIS limits its online programs to applicants who live more than 50 miles from campus and local students who have documented disabilities. Prospective students should complete 30 credits of lower-division coursework before applying to the history major. Candidates should have a minimum 2.5 GPA from classes taken at an accredited college or university. Online applicants also submit a statement of intent outlining their independent study skills and ability to complete an online degree. The University of Illinois at Springfield is regionally accredited by the Higher Learning Commission (HLC). University of Nebraska at Kearney ranks #9 on The 25 Best Online Bachelor's in History Degree Programs! The University of Nebraska at Kearney has received national recognition for its online programs. UNK offers 170 majors, including 30 online degree options. The university's online bachelor of arts in history, a degree completion program, helps transfer students with prior college credits earn a bachelor's degree. Students pursuing the history degree online gain an understanding of both past and contemporary societies. Students master critical thinking, reading, and writing skills. Graduates go on to work in public history, education, law, and business. History majors complete 36 credits in the history department, including coursework in American history and Western civilization. Distance learners choose to concentrate in U.S., European, or non-Western history. In addition to the major requirements, UNK undergraduates complete 45 credits in general education courses and six credits in a foreign language. Prospective students must hold a high school diploma or a GED. Students should also show a minimum 2.0 GPA at the college level. Candidates with fewer than 24 transferable credits from a regionally accredited institution must submit ACT or SAT scores. UNK accepts up to 66 transfer credits. As a public institution, UNK charges a lower tuition rate for Nebraska residents. University of Louisiana at Monroe ranks #10 on The 25 Best Online Bachelor's in History Degree Programs! As part of Louisiana's public university system, the University of Louisiana at Monroe offers multiple degree options, including online degrees through eULM. The school's online bachelor of arts in history builds skills in historical research, analysis, and critical thinking. ULM's history program boasts a 90% employment rate within 60 days of graduation. The online history degree at ULM includes 39 credits within the major, including a U.S. history course and a world civilization sequence. History majors also choose electives such as Louisiana history, the middle ages, Russian history, and the Holocaust. The 120-credit bachelor's degree also requires general education courses in composition, art, and mathematics. The major prepares graduates for a variety of careers, including in law, journalism, education, or civil service. In order to enroll at ULM, prospective students submit an online application with official high school and college transcripts. ULM requires SAT or ACT scores from first-time college students and transfer students. In addition to accepting transfer credits, ULM also offers prior learning assessment options, which allow students to test out of particular courses. ULM offers the same online tuition rate for Louisiana residents and non-residents. Excelsior College ranks among The 25 Best Online Bachelor's in History Degree Programs! Formerly known as Regents College, Excelsior College is a private, nonprofit institution located in Albany, New York. As a distance learning institution, Excelsior specializes in providing quality educational opportunities for adult learners. The online bachelor of science in history focuses on how societies, governments, and ideas have changed over time. The online history degree requires 120 credits, including 33 credits of history core courses. The curriculum includes 60 credits in arts and sciences and 60 credits in applied professional courses. Learners may also pursue additional arts and science courses in lieu of applied professional courses. History majors take courses in U.S. history, world history, and European history. Students also complete a history capstone course. Distance learners must maintain a minimum 2.0 GPA in order to graduate. Excelsior accepts up to 117 transfer credits, making it an ideal option for students who have already completed extensive college coursework. Prospective students submit official transcripts, as well as proof of any exams, training, and certification programs completed. Excelsior offers a significant tuition discount for military service members, veterans, and their families. Arizona State University–ASU Online ranks among The 25 Best Online Bachelor's in History Degree Programs! Arizona State University dates back to 1885, when the Territorial Normal School opened as a teacher training institution. Today, ASU is one of the largest public universities in the country, with five campuses in the Phoenix area and a robust distance learning arm. ASU Online offers over 150 online programs, including an online bachelor of arts in history. The online history degree at ASU emphasizes an interdisciplinary approach to the past, with coursework in the humanities and social sciences. Students complete 33 credit hours in history coursework, including survey courses in global history and U.S. history. In addition to major requirements, ASU students complete general education courses in composition, mathematics, and a foreign language. ASU offers courses on a 7.5 week schedule, with multiple start dates throughout the year. In order to enroll at ASU, freshman applicants submit SAT or ACT scores and official high school transcripts. Transfer students must have a minimum of 24 transfer credits with a minimum 2.5 GPA. The transfer-friendly program lets students apply up to 90 transfer credits toward the bachelor's degree. ASU offers the same online tuition rate for Arizona residents and non-residents. Thomas Edison State University ranks among The 25 Best Online Bachelor's in History Degree Programs! Named for the famous inventor, Thomas Edison State University is one of New Jersey's public institutions of higher education. Founded as Thomas Edison State College in 1972, the institution received university status in 2015. TESU provides flexible degree options for adult learners in over 100 areas of study. The school's online bachelor of arts in history teaches students how to assess historic evidence and evaluate interpretations of the past. Bachelor's degree candidates complete 120 credits, including 60 credits of general education requirements. The history major includes 33 credits of required courses in Western civilization, world history, American history, and historical methods. Students also complete a capstone research course. Distance learners choose 12 elective credits, with course offerings such as African-American history, the history of New Jersey, and the Renaissance. Compared to other online history degree programs, TESU provides a generous transfer credit policy. Transfer students from regionally accredited community colleges can transfer 80 credits, while students from regionally accredited four-year institutions can transfer 117 credits. Prospective students submit an application and college transcripts. TESU also reviews transcripts from military and professional training programs. At TESU, students choose between a per credit tuition rate or an annual tuition plan that allows up to 36 credits in a 12 month period. The school also provides a tuition discount for military students. Thomas Edison State University is regionally accredited by the Middle States Commission on Higher Education (MSCHE). University of Arizona ranks among The 25 Best Online Bachelor's in History Degree Programs! Predating the statehood of Arizona by nearly three decades, the University of Arizona was founded by the territorial government in 1885. As the state's land-grant university, UA boasts a long relationship with Tucson and the rest of Arizona. Today, the university offers over 80 online degrees through UA Online, including an online bachelor of arts in history. Inspired by President Harry Truman's statement, "The only thing new in the world is the history you don't know," UA's online history degree emphasizes analytical and logical thinking. Students learn how to assess competing interpretations and form persuasive arguments. History majors take 33 credits in the department, including at least 18 upper-division credits. Students choose from courses that explore the history of Africa, Asia, the Middle East, Europe, Latin America, and the U.S. As part of the senior course sequence, students conduct primary source research and complete a research-based paper. Seniors also select a capstone course in the geographic area of their choosing. Bachelor of arts students must complete four semesters in foreign language coursework. Applicants submit an online application form and official high school and college transcripts. UA charges the same online tuition rate for Arizona residents and non-residents. Northwestern State University of Louisiana ranks among The 25 Best Online Bachelor's in History Degree Programs! Founded on a hill overlooking Natchitoches, Northwestern State University of Louisiana once operated out of the Bullard Mansion. Today, the public institution, part of the University of Louisiana system, boasts a National Historic District on campus. In addition to in-person degrees, NSU offers online degrees through its eNSU Global Campus. The school's online bachelor of arts in history focuses on U.S. and European history. Classes span several millennia, from the Classical era to today. History majors also take classes in Louisiana and Creole history. Students complete 36 credits in the major, including 12 credits in advanced American history courses and 12 credits in European or other non-American history courses. The 120-credit bachelor's degree requires students to maintain a minimum 2.0 GPA. In order to enroll at NSU, first-time college students submit an application, proof of a high school diploma, and ACT scores. Transfer students should have either a transferable associate degree from a regionally accredited institution or 18 college credits with a minimum 2.0 GPA. NSU offers courses in eight-week sessions during fall and spring and in four-week or eight-week sessions during the summer. Transfer students can apply up to 90 credits toward the degree. NSU offers in-state tuition rates for all online students regardless of residency status. University of Idaho ranks among The 25 Best Online Bachelor's in History Degree Programs! Founded by the territorial legislature in 1889, the year before Idaho joined the union, the University of Idaho is the oldest public university in the state. From its main campus in Moscow, U of I offers over 150 degree options at the undergraduate and graduate level. U of I provides several online programs, including a bachelor of arts or science in history. The fully online degree in history from U of I helps students build research, writing, problem solving, and critical thinking skills. Distance learners take an introductory research course during their freshman year, followed by a methods course as sophomores. Seniors complete a capstone seminar and a research project. The major requires 36 credits, with 18 credits in the student's emphasis area. Concentrations include American, European, or general history. U of I's history department recommends the BA option for students considering graduate work in history. All BA students complete a 20-credit language minor. Prospective students submit official transcripts from high school and all colleges attended. First-time freshmen and transfer applicants with fewer than 14 college credits must also provide SAT or ACT scores. U of I conducts admissions on a rolling basis, but admitted students must start in fall or spring semester. Once enrolled, students can also participate in internship and study abroad opportunities. U of I offers in-state tuition for all full-time online students. Granite State College ranks among The 25 Best Online Bachelor's in History Degree Programs! Since it was founded in 1972, Granite State College has devoted itself to helping working adults earn college degrees. Granite State reaches thousands of students each year through its main campus and online options. Approximately 86% of Granite State's distance learners enroll as transfer students. In addition to other liberal arts majors, Granite State offers an online bachelor of arts in history. Granite State's history major emphasizes historical development from the ancient period to today. Students gain critical thinking, research, and writing skills. History majors complete courses in U.S. and European history, historical methods, and the U.S. in world affairs. Students must take 16 credits of upper division history courses through Granite State. Granite State undergraduates earn a total of 120 credits for the bachelor's degree, with general education coursework in English, communications, and mathematics. Incoming students can apply up to 90 transfer credits toward the bachelor's degree. Prospective students submit an application, proof of a high school diploma or equivalent, and transcripts showing all college credits earned. The school does not require SAT or ACT scores. As a public institution, Granite State offers a discount to New Hampshire residents. Westfield State University ranks among The 25 Best Online Bachelor's in History Degree Programs! Westfield State University, located 12 miles from Springfield, Massachusetts, boasts a history dedicated to equality. Founded in 1839 by social reformer Horace Mann, Westfield State was the first co-ed college in the country open to all students regardless of race, creed, or economic status. Today, Westfield State offers several online liberal arts degree completion programs, including a bachelor of arts in history. Unlike most degree completion programs, Westfield State's online history degree accepts both new and transfer students. History majors complete 43 credits, with required courses in American and Western history. Students also complete 18 credits of history electives in areas like Medieval Europe, Latin American history, and American popular culture. Students can complete the degree in as little as one year with transfer credits. The department offers semester-based courses as well as accelerated seven week classes in fall and spring. Students may also enroll in an intensive January session and six-week summer sessions. In order to earn a bachelor's degree, Westfield State students take 120 credits, including general education requirements. Westfield State participates in the Mass Transfer Compact, which allows local community college graduates to complete their bachelor's degree online in two years or less. Incoming students can transfer in up to 76 credits as long as they take 21 credits of major history courses at Westfield State. Southern New Hampshire University ranks among The 25 Best Online Bachelor's in History Degree Programs! With more than 200 degree options and over 90,000 online students, Southern New Hampshire University is a national leader in online education. The fully online bachelor of arts in history at SNHU features concentrations in American history, European history, Middle Eastern history, and military history. The online degree in history at SNHU analyzes the links between past societies and the modern world. The program prioritizes analytical and critical thinking skills. Students complete 42 credits of history coursework, including U.S. history, world history, and concentration courses. The military history concentration, for example, includes coursework on the Civil War, World War I, and World War II. History majors complete a capstone course culminating in an argument-based research paper. Bachelor's students must earn 120 credits, including 45 credits of general education courses. Incoming students can transfer up to 90 credits toward the degree. Prospective students work with an admissions counselor to complete the enrollment process. SNHU offers rolling admissions, and new students may begin six times a year. Each term lasts eight weeks. The university offers a 30% tuition discount for U.S. service members and the spouses of active duty service members. King University ranks among The 25 Best Online Bachelor's in History Degree Programs! Located in the foothills of the Smoky Mountains, King University integrates academics and faith through a Presbyterian education. Dating back to 1867, King specializes in liberal arts education. Today, the university also provides online degrees, including a bachelor of science in history. The online degree in history at King University emphasizes Western history, non-Western history, and historical research. The curriculum requires 48 credits of major coursework, including U.S. history, public history, and the Cold War. Students build strong writing and research skills. Learners complete a comprehensive assessment in their major prior to graduation. King requires 124 credits in order to earn a bachelor's degree. History majors can complete major requirements in as little as 16 months. King's program appeals to transfer students with significant college credit. Incoming students must have a minimum of 45 credits to gain admission to the program, and the school accepts up to 76 transfer credits. Prospective students submit an application and transcripts from all colleges or universities attended. Candidates should also possess a minimum 2.2 college GPA. With the help of a King University student support specialist, new students complete a plan of study outlining the courses they need to earn the bachelor's degree. King University is regionally accredited by the Southern Association of Colleges and Schools Commission on Colleges (SACSCOC). Ottawa University ranks among The 25 Best Online Bachelor's in History Degree Programs! A private Christian university located in Kansas, Ottawa University also operates campuses in Arizona, Milwaukee, and Kansas City. In addition to in-person classes, OU provides multiple online degree options. The fully online bachelor of arts in history emphasizes the impact of past events on contemporary problems. OU's online history degree requires 34 credits of major coursework, including courses in American and world history. History majors choose 12 credits of history electives, with course offerings such as American women's history, ethnicity in American history, and religion in American culture. Majors also take either a seminar in world history or a topic in American history. These senior seminars include an individual research project. All OU undergraduates complete 124 credits to earn the bachelor's degree, and students must maintain a minimum 2.0 GPA in order to graduate. Applicants can apply to OU by submitting an admission application and official transcripts from all previous colleges. First-time college students must provide high school transcripts and ACT or SAT scores. Non-high school graduates may apply with a GED, ACT or SAT scores, and an essay. OU accepts up to 80 transfer credits toward the bachelor's degree. The university grants conditional admission with unofficial copies of transcripts. Mount Mary University ranks among The 25 Best Online Bachelor's in History Degree Programs! Founded in 1913, Mount Mary University is a women's college located in Milwaukee, Wisconsin. Affiliated with the School Sisters of Notre Dame, the private Catholic university welcomes students of all faiths. The institution offers online, evening, and weekend classes, including several online liberal arts degrees. Mount Mary's bachelor of arts in history emphasizes the study of diverse groups of people and their perception of the world. Students enrolled in Mount Mary's history degree practice critical thinking skills and develop analytical and interpretive abilities. History majors can complete the degree with a mix of traditional on-campus and online courses. Students take 128 credits to earn the bachelor's degree, with general education coursework in writing, math, and world languages. The history major requires 32 credits, with an option to specialize in history teacher education. All history majors complete an internship or cooperative study project. Applicants submit high school and college transcripts. First-time college students also provide ACT or SAT scores. Compared to other online history degree programs, Mount Mary boasts a generous transfer policy. The institution allows students to transfer up to 72 credits from a two-year school or unlimited credits from a four-year institution. Graduates must complete their last 32 credits at Mount Mary. Mount Mary University is regionally accredited by the Higher Learning Commission (HLC). Nicholls State University ranks among The 25 Best Online Bachelor's in History Degree Programs! Located in the heart of the Mississippi River delta, Nicholls State University sits 50 miles west of New Orleans. The comprehensive regional university dates back to 1948, when it was founded as part of Louisiana's public university system. Today, Nicholls offers several online liberal arts degrees, including a bachelor of arts in history. With a focus on modern America, Europe, and Asia, Nicholls's online history degree closely examines the nineteenth and twentieth centuries. History majors complete 36 credits in their major and 18 credits of history electives. Electives must include three upper-level credits in United States, European, and non-Western history. All Nicholls graduates complete 120 credits of coursework, including general education requirements in English, quantitative reasoning, and humanities. The Department of History and Geography emphasizes critical thinking and strong writing skills. In order to enroll, prospective students must submit transcripts from high school and any colleges attended. Transfer students should have a minimum 2.0 college GPA. Incoming freshman must hold a minimum 2.35 GPA and submit ACT scores. Nicholls accepts up to 90 transfer credits earned at a regionally accredited institution, but students must earn the majority of major credits at the school. Nicholls State University is regionally accredited by the Southern Association of Colleges and Schools Commission on Colleges (SACSCOC). University of Maryland - University College ranks among The 25 Best Online Bachelor's in History Degree Programs! Located in Prince George's County, the University of Maryland University College has offered degrees since 1947. Today, UMUC operates additional campuses in the Baltimore-Washington area, as well military installations around the world. With over 90,000 students, UMUC's distance learning program ranks as one of the largest in the world. As one of the first schools to offer an online history degree, UMUC boasts nearly two decades of experience teaching history online. History majors complete 33 credits of coursework, including world history, Western civilization, U.S. history, and historical methods. Students choose 12 upper-level credits in either U.S. history or world history. History majors also take a capstone course in their senior year, during which they complete a research-based thesis paper. The program connects students in the Washington, D.C. area with internships and jobs at public and federal institutions. Students must maintain a minimum 2.0 GPA. UMUC allows up to 90 transfer credits, but half of the required major credits must be earned at UMUC. Prospective students complete an online application for admission and provide transcripts showing dates of attendance and any degrees or credits earned. UMUC provides a tuition discount for Maryland residents and military. Ohio Christian University ranks among The 25 Best Online Bachelor's in History Degree Programs! Ohio Christian University is affiliated with the Churches of Christ in Christian Union. Originally founded in 1948 as a Bible college, OCU focuses on online education through the OCU Online Plus program. Among many liberal arts degree options, OCU offers a bachelor of arts in history for students seeking a faith-based program with a focus on the past. Students pursuing the history degree online learn about the faith traditions that shaped Western history and the U.S. The 120-credit bachelor's program includes 36 credits in general education requirements and 12 credits in Bible, theology, and leadership courses. History majors complete 36 credits in the department, with at least 24 credits in upper-division history courses. Students choose from several course options in U.S. history, Western civilization, and church history. All majors take a 3-credit colloquium. Seniors choose either a research seminar or an undergraduate thesis. The thesis option requires a research-based paper completed with the help of a faculty mentor. Prospective students submit official transcripts from high school and all colleges attended. Candidates also submit ACT or SAT scores. Regular admission students must hold a minimum 2.5 GPA and adequate test scores. Students who do not meet the minimums can receive provisional admission. OCU may not require standardized test scores from older learners and transfer students. In online history degree programs, you'll examine historical figures, places, events, and ideas. Common courses in the major focus on U.S. and world history. Degree candidates also discover how to perform quantitative and qualitative analysis and present findings from research. While most online history curriculums are based in the humanities, some programs differ. An educational institution may offer a broad curriculum with survey courses in historical methodology and western civilization, or a program with courses centered around a specific historical theme, such as Mediterranean history or Chinese history­­. Students can pick and choose elective courses to explore different cultures and time periods, designing a program for their interests. Most curriculums for an online degree in history require learners to complete one or more writing courses. A degree candidate may also tailor their program by completing a minor -- such as business, anthropology, or political science -- or a concentration focused on a specialized area of history, such as American, European, or Middle Eastern history. To complete an online history degree, a school may require a final capstone project, which typically involves creating a research project and paper. What Will I Learn in an Online Bachelor’s in History Program? In an online history degree program, you'll typically receive a foundation in western civilization and U.S. history. Courses focus on the development of critical thinking, writing, and research skills. The list below highlights three common courses found in the curriculum for an online history degree. World History: A world history course provides a survey of global civilizations, usually from prehistoric times to the 1500s. Degree candidates examine human connections and civilizational development, and compare social, religious, political, and cultural institutions. A world history course also focuses on analyzing historical methods and learning how to think critically about history. U.S. History: A U.S. history course teaches learners how to interpret current events and ideas in a historical context. Degree candidates usually study U.S. events occurring at different time periods. This course prepares students for graduate school, a career teaching history or social studies, or working at historic sites or museums. Historical Writing: In a historical writing course, degree candidates learn how to identify research methods, locate and evaluate sources, and construct a framework for a historical research project. This writing course goes beyond studying the historical research and writing process; it also prepares learners for a career in education, law, politics, or journalism. An online history degree prepares you for many different careers. Graduates find employment in several fields other than history, including law, politics, education, business, and international relations. Degree candidates who pursue a career in education may work in a classroom or museum. Listed below are three common careers for graduates with an online degree in history. Historian: Using historical documents and sources, historians write about the past, gather information, analyze data, compare historical trends, and interact with the public at educational programs and presentations. Historians may work for organizations, historical associations, businesses, and governments. Historians may also work alongside museum curators and archivists to preserve and explain the past. While some historians receive entry-level employment with only a bachelor's degree, most positions require a master's degree. High School Teacher: Usually specializing in one subject area, such as history, high school educators teach adolescents. High school teachers assess student learning, plan and deliver lessons, grade assignments, and supervise students outside of the classroom. Some high school teachers may also serve as an adviser for groups or clubs that meet before or after school. Under state requirements, high school teachers must hold at least a bachelor's degree and, in some states, major in a specific subject area, such as history. Museum Curator: Also known as museum directors, museum curators oversee the purchase, loan, and sale of museum collections. Museum curators also direct the storage and exhibition of a collection. Museum directors may research collection items, perform administrative tasks, help manage research projects and educational programs, and represent the museum at professional events. While graduates with only a bachelor's degree may obtain employment in small museums, most curator positions require a master's degree in history or a related field. When researching an online degree in history, it's important to check the school's accreditation status. The accreditation process helps determine whether a school provides a quality education. Generally, an educational institution will hold either regional or national accreditation. A regionally accredited school has been certified by one of seven regional agencies, which cover different areas of the country. The school's geographical location determines the assigned regional agency. National accreditation, which is usually awarded to for-profit institutions, only comes from specific agencies sponsored by the Council for Higher Education Accreditation (CHEA). Regionally accredited schools do not usually accept credits from nationally accredited institutions. You will also want to look for accreditation from the Council for the Accreditation of Educator Preparation if pursuing an online history degree for a career as an educator. History professional organizations offer degree candidates and recent graduates a number of advantages when preparing to enter the workforce. The list below shows three major organizations in the United States for history professionals. As a member of a professional organization, you can receive access to the latest research and case studies in the field. The associations offer member benefits, including access to the OAH's Journal of American History and other publications; continuing education; discounts on membership conferences and products, webinars, job and scholarship listings; and networking opportunities. Organization of American Historians: Founded in 1907, the OAH serves more than 7,800 historians working in the U.S. and abroad, including college and university professors, archivists, museum curators, and students. This professional society strives to promote the scholarship, teaching, and presentation of American history. American Association for State and Local History: The AASLH, a national association founded in 1940, offers leadership and support for professionals who interpret and preserve state and local history. A national standards program for small and medium history organizations, the AASLH provides members with a database of more than 1,000 online resources. National Council on Public History: Operating at Indiana University-Purdue University Indianapolis, the NCPH encourages collaboration between the public and historians. Members can attend the NCPH's annual conference and receive a quarterly journal, The Public Historian, which provides historians with the latest knowledge and applications from the field.